Coming in early October 2014 and as a follow up to our simply awesome Female Retained Knights are some more ladies for The Ion Age sculpted by Sam Croes. This time a second Muster Squad of ten poses. You can read the posts about the women on the Retained from last year HERE and HERE. Since they were released we have had a steady influx of messages asking for more females and we did do this with Ellen and Ripley but now its the turn of the more approachable Muster to get the same treatment. The second Muster Squad was a given since our starting day since our 1st Muster Squad was the sum total of this arm of the Prydian Army in our 15mm range. We did add Muster Patrol and their command too but when it came time to design the next normal squad we voted and chose a female only pack of ten poses. The Muster are the bulk of well trained troops who travel to war on different planets and space platforms and so on. They greatly outnumber the Retained Knights but they do not have powered armour instead they wear Aketon high impact armour with an enclosed helmet and carry mainly the Moth series of weapons such as the iconic Moth Type 6 9mm Auto Rifle. There are female troops in every Muster Regiment. Anywhere from ten percent to an average of thirty percent right up to the famous 'Lady Luck' 88th Muster Regiment that is almost entirely female in its ranks. But more on the 88th later. 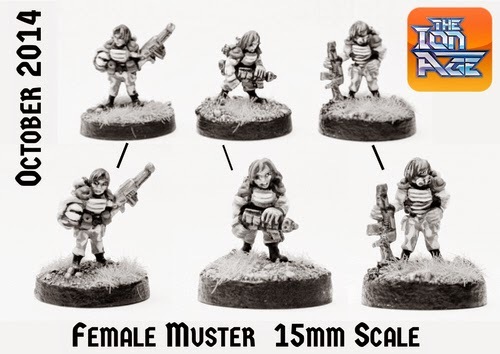 The image in this short article shows you three of the ten different female miniatures that will be in IAF059 2nd Muster Squad. All the poses were sculpted by Sam Croes our lead designer and most of them are bare headed which sets them apart from their counterparts. Subtle changes to the Aketon clam shell chest armour along with the legs and hair and faces set these 15mm miniatures apart. In the pack there is a lesser officer or sergeant with a Tumbler Mpi along with several poses with Moth Type 6 Rifles and a trooper armed with a Minstrel PP2 Taser (a rarer support weapon) and the first ever trooper with a Ron 32mm Hi-Ex Launcher. There is also a trooper with a Hermit 44mm Plasma Rifle. As you can see in the image there is a pose with the breather mask, typically inside the Aketon Helmet, still worn on her face. Lovely touch. Its a really varied pack. If you have requests for additions to the Prydian Army or the Legions of the Shia Khan Empire then do let me know. While we have a grand plan for The Ion Age we do slot in the most requested packs from time to time and this is such a pack. We hope you like our new ladies and you will be seeing them all in a couple of weeks.